The tree is handmade on a jig and is therefore always symmetrical. It has no metal components. It consists of laminated plywood, leather, carbon fibre and kevlar. Its rails are flexible and move with the horse’s back. They are parallel to the horse’s spine along their entire length, ensuring optimal distribution of the rider’s weight. The points play no part in weight carrying, they simply provide lateral stability. The saddle therefore sits AROUND the horse, NOT ON IT. W – Suitable for more delicately built horses, such as TB’s and slightly built Arabs, as well as other backs with an A-frame shape side-to-side and a slight curve from wither to croupe. S – Suitable for more solidly built TB’s and lighter-weight Warmbloods, also some Iberians. This tree fits A-framed backs that are straight, rather than curved. I – Very suitable for Baroque horses (PRE, Lusitano, Lippizzaner), some Arabs and many other wider backs with gentle curves. IC –A bigger cousin to the S, but much less angled side-to-side. Suits substantial Warmbloods or any other back which is fairly wide and flat, yet still has some wither. C – Brilliant for the table top back found in draft-types or native breeds (flat in all dimensions, very little wither), but also useful for very wide individuals of many other breeds, including Arabs. This tree has made many horse owners smile after almost giving up hope! L – Suitable for wide-withered Baroque shapes, such as Fresians, but also Haflingers, Welsh Cobs etc. Suits a gentle curve from wither to croupe, not as flat as the C.
The panels consist of a dense visco-elastic shock-absorbent foam, which reacts to heat and pressure. Firm when cold, they are quickly softened by the horse’s body heat plus the rider’s weight and reach a consistency best compared to raw steak. They mould completely to the horse’s back, follow every movement and are extremely comfortable for both horse and rider. The multi-stretch membrane used to encase the foam is particularly suitable for conducting body heat into the foam and allowing the shape changes of the panels. Having adapted to the horse while in use, the panels always return to their original shape. They require no maintenance of any kind. The panels can be made in 3 different thicknesses (24mm, 30mm, 36mm), giving a wide range of options for different types of back. The stirrup bar is not recessed in any way, to avoid pressure on the horse’s back. Its location is designed to allow the rider a natural leg position. Strada saddles are made exclusively from fine English leather. 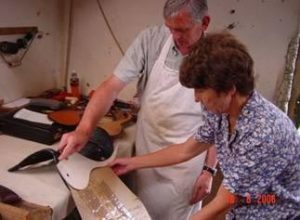 Strada saddles are individually made to order here in the UK. Production takes from 6-8 weeks (sometimes we can deliver sooner, but we will not promise what we cannot guarantee!). All accessories (except numnahs) are also made in-house. The main pages show both the Vienna and the St.Christopher with the standard knee pad. For riders who prefer a bigger knee block, both models can be equipped as shown in the picture below. 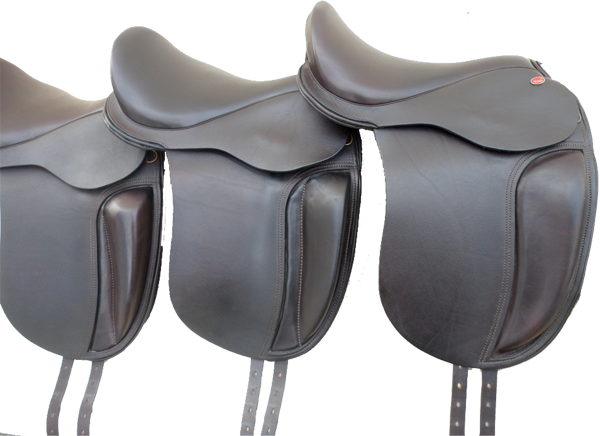 The cantles for the Vienna, St.Christopher and Vario saddles are normally at 35°, while the Duo has the 45° cantle: it slopes back just a little more. This can however be changed if the rider prefers. The Duo can have a plain knee pad if used as a GP, or a substantial knee and thigh block, if used as a jump saddle. The Vario can have a knee roll or plain pad if preferred. If there are dramatic changes in a horse’s back, as might be the case after illness, long periods off work or when recovering from muscle atrophy, or if the saddle is permanently needed for a different horse, the tree can be chaged, i.e. the saddle can be dismantled and reassembled on a different tree type. Changing the panels to new ones of a different thickness is also possible. The above features give Strada saddles excellent stability, particularly on wide and/or round backs, without any need for an overly-tight girth. The closeness of the design also gives the rider superb “feel” of the horse’s every movement. Since the tree is designed to be anatomically correct for the horse, the seat is flatter than in many other saddles. While this may initially feel slightly strange to some riders, most find it comfortable as it will allow them to position their pelvis in a way that is right for the individual, rather than having it forced into a specific place and angle. The stirrup bar is correctly positioned for the rider’s leg to hang naturally and no muscle effort is required to hold it in place. If you would like to try a Strada Saddle, please contact us by e-mail or telephone (outside office hours is fine!) to discuss your horse’s needs and to arrange a fitting visit. You will be able to ride in our demonstrator saddles and assess thoroughly how your horse’s performance is influenced by a Strada. At Strada we attach particular importance on the feedback you receive from YOUR HORSE: If there is any doubt as to which one of two fits is more suitable, it is always the one in which the horse moves more freely and is more relaxed! Strada saddles are not sold in shops. They are only distributed by Strada Saddles UK Ltd. and fitted by people who joined Strada because they bought a Strada saddle for themselves and were impressed by it. They are all experienced riders and will understand your concern for your horse’s comfort. Even our saddlers are riders! All Strada products are guaranteed for 1 year against faulty materials and/or workmanship. We like to maintain contact with our customers and to offer a personal service. 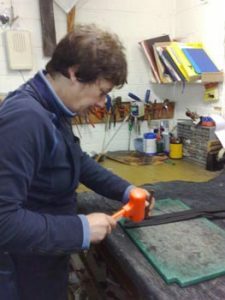 If you have any questions about your saddle, your horse or your riding in general and think we could help, please, get in touch.